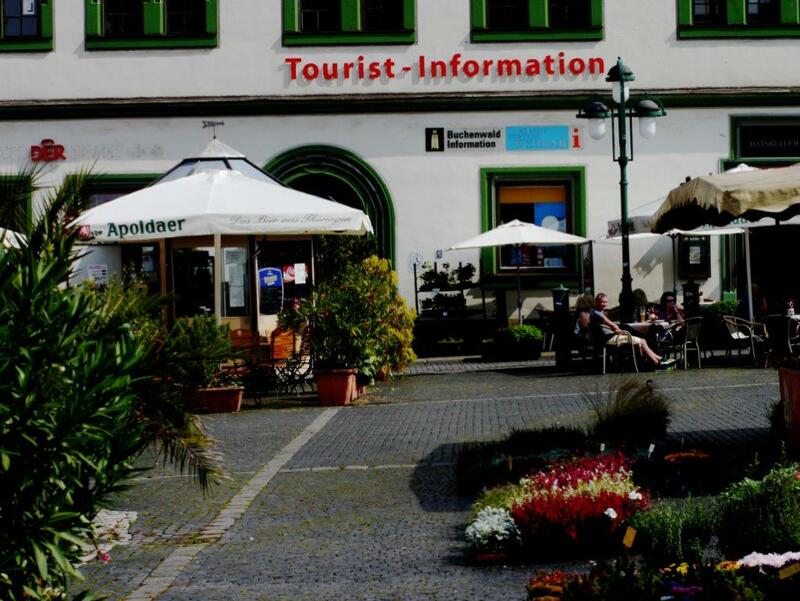 Here you will quickly get an overview of the tourist attactions amid culture in Weimar, these are all within walking distance of the hotel. Ask us for the map, we will be happy to give you more tips! 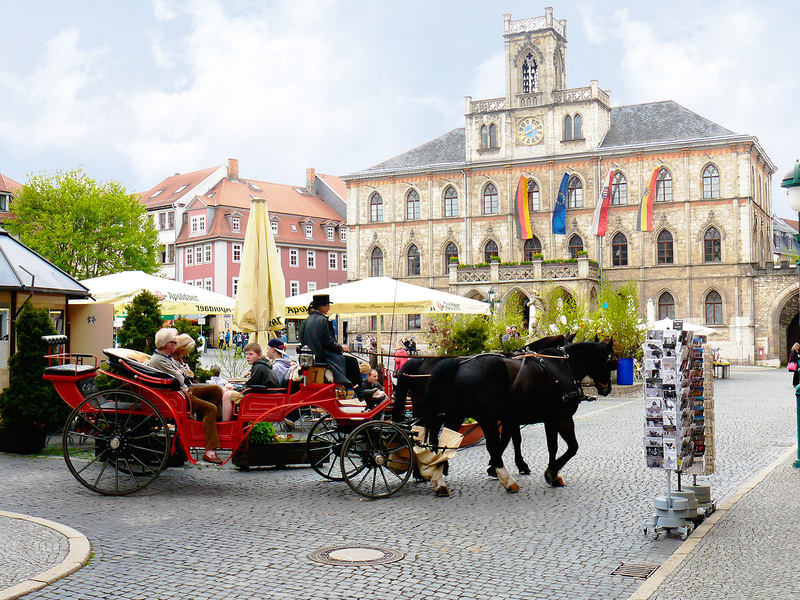 Take a look at our packages, which include the Weimar Card or Thüringen Card with free admission to various sights. Unfortunately the tickets can only be booked on the internet, so we can not offer any packages. 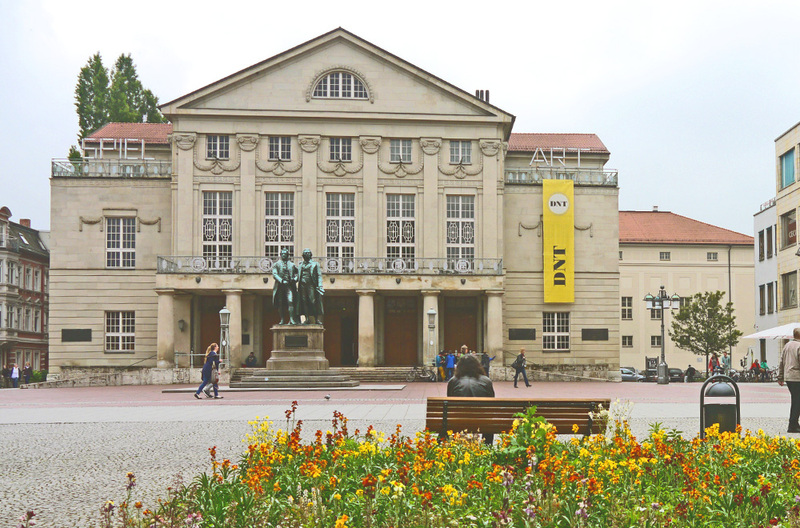 The long building opposite the German National Theatre was built as a carriage house in 1823. The façade with its three-axis central projection and triangular pediment is an example of the harmonious classicist style of Clemens Wenzeslaus Coudray. The original round windows were replaced by large continuous bay windows when the function of the house changed and it was used as a depot for the court theatre. The house has been accommodating the Bauhaus Museum since 1995. The museum presents the activities of the Staatliches Bauhaus under Walter Gropius in the Weimar period from 1919 to 1925 in an extremely objective and clear manner, as well as including those of its predecessor, the Kunstgewerbliches Seminar (1907-1915) under Henry van de Velde and of the Bauhaus successor, the Staatliche Hochschule für Handwerk und Baukunst (1926-1930) under Otto Bartning. On 7 January 1780, a comedy theatre was opened on today’s Theatre Square. Initially the “theatre for connoisseurs” played on this stage until 1783.This was a social group of noblemen and noblewomen as well as members of the bourgeoisie including Anna Amalia, the duke’s mother, and Goethe, who wrote lyrical dramas and also played in them as an actor. The professional Bellomo theatre company played here from 1784 to 1791 but was soon no longer able to satisfy the high demands expected of it. Between 1791 and 1817, Goethe was the director of the court theatre as it was called during this time. Works by Goethe, Schiller, Lessing, Shakespeare, Iffland, Kotzebue, among others, were played there, as were operas by Mozart, especially Don Giovanni.The theatre experienced a veritable heyday between 1795 and 1805 when Goethe and Schiller worked there together. The classical Weimar theatre style developed over this period. Goethe’s aim was to foster the educational effect of the art of theatre. Thanks to Johann Nepomuk Hummel, who was one of Mozart’s students, the music theatre enjoyed an upswing which continued under Franz Liszt after 1848. The premiere of Wagner’s Lohengrin in 1850 was particularly remarkable. Liszt left the theatre in 1858 after the theatre scandal at the first performance of the Barber of Bagdad by Peter Cornelius. Richard Strauß (1864-1949), who was the second director of music from 1889 to 1894, staged the first performance of Engelbert Humperdinck’s opera Hansel and Gretel in 1893 and Guntram, his own first opera, in 1894. After reconstruction in 1798 and the erection of a new building in 1825, the theatre was newly built in representative neo-classical style under the management of Max Littmann, the then most important theatre architect. 1,860 oak piles were driven into the ground to improve the unfavourable subsoil conditions. After World War I and under the management of the poet Friedrich Wilhelm Ernst Hardt (1876-1947), the National Theatre, as it was then called, was declared the German National Theatre on 19 January 1919. As from 6 February 1919, the constituent national assembly convened in the theatre. On 31 July 1919, Germany’s first democratic constitution, the “Weimar Constitution” was adopted by the National Assembly and became effective on 14 August. On 3/4 July 1926, the first national party convention of the newly founded NSDAP took place in the presence of Adolf Hitler. Apart from the façade, the entire theatre was destroyed during an air raid on 9 February 1945. At the instigation of the Soviet military administration, theatre performances were restarted in Weimar Hall on 10 July 1945. From 1945 up to his death in 1956, Hermann Abendroth was the conductor of the state orchestra, followed by Gerhard Pflüger from 1958 to 1973. On the occasion of Goethe’s 200th birthday in 1949 and the 150th anniversary of Schiller’s death in 1955, Thomas Mann gave the commemorative speech in the German National Theatre. A fire that broke out in Seifengasse in 1889, gave rise to the decision to buy and demolish the three houses neighbouring on Goethe’s home to protect it from the risk of fire. In 1913/14, this now free space was used for a museum extension under the management of the architect Jakob Schrammen (born in 1871). A new building was added to the museum extension in 1935. During the conversion of the entrance hall by the architect Günther Fischer, Berlin, in 1999, a remarkable flight of stairs with a glass dome was created. 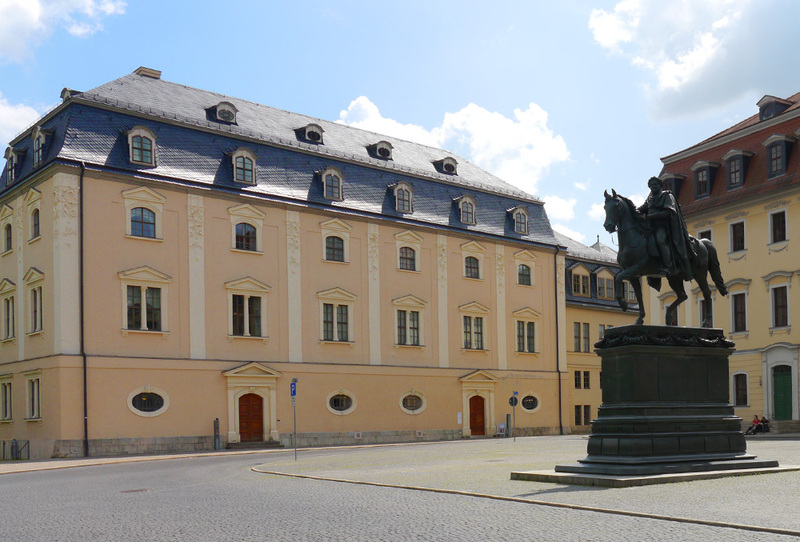 The museum focusing on German classicism mainly exhibits items from the extensive Goethe collections. The building that terminates the row of houses of Ackerwand Street in the west is part of the Goethe museum’s new or annex building. After World War I, the intended extension of the museum was not possible. By 1930, the required neighbouring properties had been acquired and by 1931 the buildings had been demolished. Construction work, however, did not start until 1934/35. A plain two-floored functional building with a mansard was built as designed by the Weimar architect Walter Voigt. The new building was opened on 28 March 1935 which is Goethe’s birthday. The national-socialist leadership celebrated the completion of construction work as their success especially since Hitler had provided a large amount of money. This was the reason why his bust was set up in the museum’s entrance hall. Blasphemy against Goethe in view of the fact that books by German authors had already been burned near Weimar on 21 June 1933. Goethe’s garden house was surrounded by an idyllic garden and located on the eastern periphery of Weimar. The white-grey colour is as it was in Goethe’s time. Found themselves in the best of spirits. The earliest authentic record for the house, a change of title, originates from 1635. Though converted several times, it is thus one of the town’s oldest secular buildings. In 1776, Duke Carl August bought the dilapidated former vineyard house and garden estate for 600 talers and gave it to Goethe as a present after refurbishment. Thanks to this possession, Goethe was able to obtain citizen’s rights. Goethe moved into the house in the spring of 1776 and it remained his main residence until 1 June 1782. He made the house and garden a “refuge where he could clean himself of the dust from files and the stuffy air of the court”. During this period in which he had a close relationship to nature, he designed an English garden, laid out hedges, planted spruce and beech trees from the nearby Webicht forest as well as Weymouth pine and Virginia cedar trees which he acquired in Frankfurt. At this time, he wrote sensitive nature poems such as To the Moon, Erlking and The Fisherman. Goethe worked here on Iphigenia in Tauris, Egmont, Tasso and Faust. Goethe lived a secluded live, surrounded by three domestic servants, one of whom was Philipp Friedrich Seidel, and a cook. He was also surrounded by bees and hens and a dog. 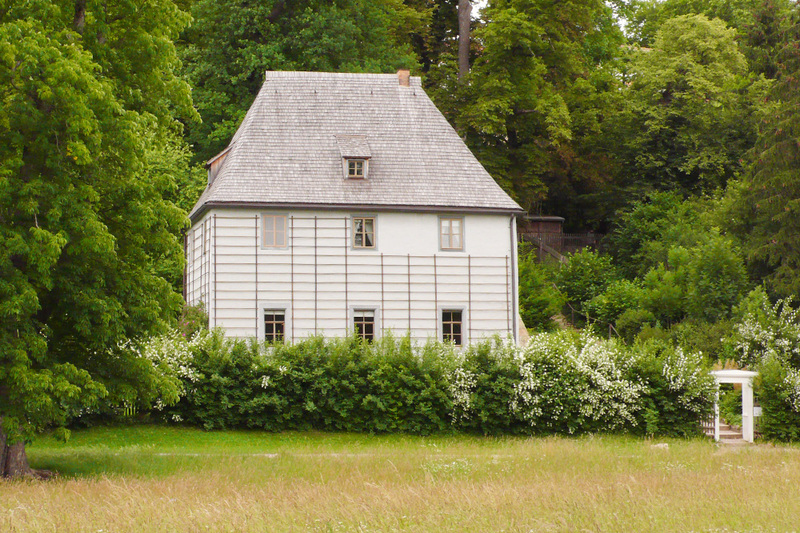 Even after he had moved to his Frauenplan home, Goethe still retreated to the garden house. Near the garden house he met Christiane for the first time. She handed over a request from her brother in which he asked Goethe for employment in the library. As late as 1830, Goethe had white garden gates installed. In the same year he had the ground outside the front door of the house paved with pebbles from the Saale river in the Pompeian pattern whereby the slope was dug away to form an arch shape. Goethe planted vines in the late autumn of 1831. On 20 February 1832 he came to the garden on the Ilm river for the last time. Goethe erected the first non-figural monument in the garden in the spring of 1777, the Stone of Good Fortune, which Goethe called “Agathe Tyche”. A sandstone cube symbolises the firmly established, the lasting – the character. The sphere on top stands for the less lasting, for fortune – here his love for Charlotte von Stein. In the autumn of 1782, Goethe mounted a stone panel over a seat which he dedicated to his love for Charlotte von Stein. “Here in silence reflected the lover upon his beloved” begins the poem. Due to its location, the garden house did not fall under the ban on wooden shingles of 1847 and now is the only wood-shingled house in Weimar. Wolfgang Maximilian von Goethe (1820-1883) temporarily lived in the garden house as of 1847. Today the Weimar Classics Foundation manages the house and uses it as a museum. The first building erected on today’s Platz der Demokratie was the pleasure or garden palace, the New Palace with the “Welschen Garten”, which was commissioned by Duke Johann Wilhelm (born in 1530, who reigned from 1554 to 1573). Master builder Nicol Gromann (around 1500-1566) and after his death the Dutchman Erhard van Mehren created one of the early Renaissance buildings between 1562 and 1569. The designation “French Castle” which was also common has its origin in building funds from the duke’s military assistance for the French king. The name “Green Castle”, which only became popular after 1618, either related to the patina of the copper roofing or to green tiles found in the door area. The iron-grated east windows on the ground floor with the golden initials of the building owners, HWHZS and DSHZS (Hans = Johann Wilhelm Duke of Saxony and Dorothea Susanna Duchess of Saxony) as well as the year of construction 1563, date back to the time when the castle was built. The windows of the upper floor with a middle column and triangular pediment as well as the arcade arches acting as pillars supporting the east slope originate from the same time. In 1767, Duchess Anna Amalia ordered the relocation of the library to the Green Castle. The castle was redesigned in late Rococo-style between 1761 and 1766 according to the plans of the Eisenach master builder August Friedrich Straßburger (around 1725-1765). An oval library hall, the Rococo hall, was created integrating the upper floors. Pilasters with an elegant Rococo decoration structure the outer façades. From 1797 onwards, Goethe together with his minister colleague Christian Gottlob Voigt took over the supervision of the library. They pushed ahead with expanding the stock of books held. User regulations were drawn up in 1798. Goethe’s brother-in-law, Christian August Vulpius, worked there as a librarian. Goethe commissioned Heinrich Gentz, who was involved in the construction of the town castle, to extend the building in plain classicist style towards the south. Between 1821 and 1825, Oberbaurat Clemens Wenzeslaus Coudray and Baurat Carl Friedrich Steiner added a storey to the neighbouring town tower from 1453 and integrated the tower into the building complex via a neo-Gothic front section. Two sections pointing northwards were added to the library building according to a design by Coudray from 1841 to 1844 and are the last extensions to the library building. 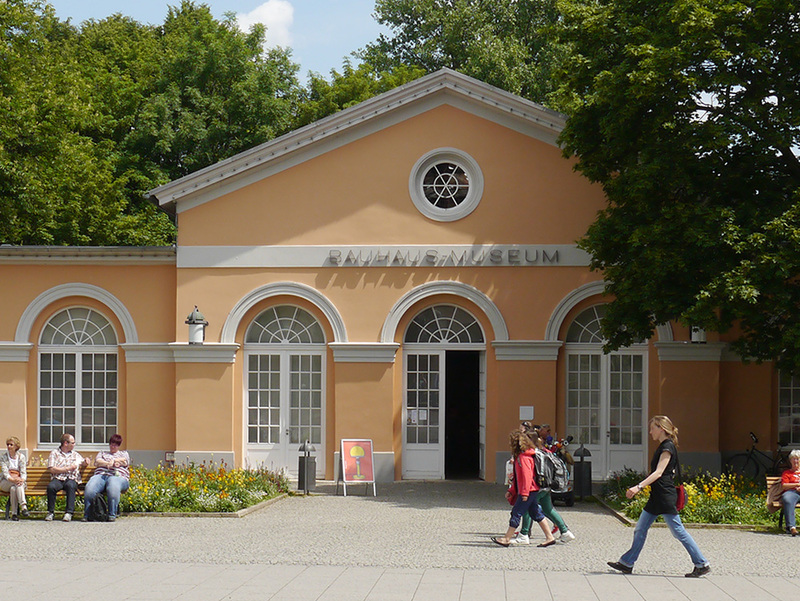 This annex, the style of which was adapted to match the existing building, was inaugurated in 1849 on the anniversary of Goethe’s 100th birthday. The library has a stock of around 900,000 books, corresponding to around 20,000 meters of literature. 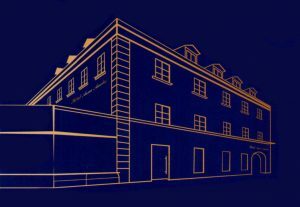 Thanks to a generous extension of the library in 2002/04 when the Red and Yellow Castles, the New Guardhouse as well as a two-storey underground stockroom under the Platz der Demokratie were integrated, the library now has enough space to accommodate its entire stock. The library complex also includes a book cube. The result is a modern science library of the 21st century. While the library was being redesigned, the roof of the original main building was destroyed by a fire on 2/3 September 2004. The fire spared the southern classicist extension as well as the northern annex from 1849 which is separated from the main building by a fire wall. About 70,000 books burned during this night. The Rococo hall and its stock of books were damaged by the water used to extinguish the fire. Despite the fire and the reconstruction work necessary as a result, the study centre was opened on 4 February 2005. The roof structure built to replace the one that burned down was celebrated with a topping-out ceremony on 24 October 2005. The restoration of the Rococo hall was completed by 2007. This part of the library is the so-called “Centre for the Old Book”. The library’s focus is German literature from 1750 to 1850, i.e. from the age of Enlightenment to late Romanticism. Apart from the works of German classicism including the Faust collection and books of folk stories, the Shakespeare collection with around 10,000 volumes, around 2,000 pamphlets from the time of the Reformation and Peasants’ War and the first complete bible by Hans Lufft, Wittenberg 1534, are also among the library’s treasures. Today’s Schiller House was built by the contractor Anton Georg Hauptmann on the former Esplanade on the foundations of the inner town wall in 1777. A slightly recessed Renaissance-style house was also integrated into the new building, however, offset by half a storey. The steep Baroque mansard roof was covered with tiles until 1843. The façade’s yellow colouring is the same as that used for the house at the time it was built. When it was Schiller’s home, the house was painted grey. Schiller paid 4,200 talers for the house and lived there from 29 April 1802 up to his death on 9 May 1805. He wrote to his publisher Göschen: “I have finally fulfilled a long-cherished wish, which is to have my own house. For I have now given up all plans to leave Weimar and I intend to live and die here.” Schiller had some changes made to the house such as a gable window in his study. The kitchen was located on the ground floor, the first floor accommodated the family rooms and the rooms of Schiller’s wife. Schiller’s own rooms were in the quietest part of the house, the mansard. Schiller’s study, where he also died, is located behind the two right mansard windows and the gable window. This is the room where he wrote the dramas “The Bride of Messina” (first performance on 19 March 1803), Wilhelm Tell (first performance on 17 March 1804) as well as the Demetrius fragment. Schiller’s wife Charlotte (1766-1826) stayed in the house with her four children Karl, Ernst, Caroline and Emilie, born in 1793, 1796, 1799 and 1804, who left their parents’ house one after the other. She let some of the rooms, among them Schiller’s study. After her children had left, Charlotte moved to Bonn where she died in 1826. The heirs sold the house in 1827 and the furniture was bequeathed or auctioned. In 1847, the town of Weimar bought the house as a memorial. It was also temporarily used by the Schiller Foundation as well as the Goethe and Shakespeare Society. A part of the furniture of the Schiller House was returned. Schiller’s desk, for example, was handed over by his grandson Friedrich in 1862. The bed in which Schiller had died was returned by Grand Duke Carl Alexander in 1847. Despite being damaged by an air raid on 9 February 1945, the Schiller House already reopened on 10 November 1946. The house underwent comprehensive reconstruction before 1988, and since then a variety of original exhibits have been conveying the atmosphere in which people lived at around 1800. 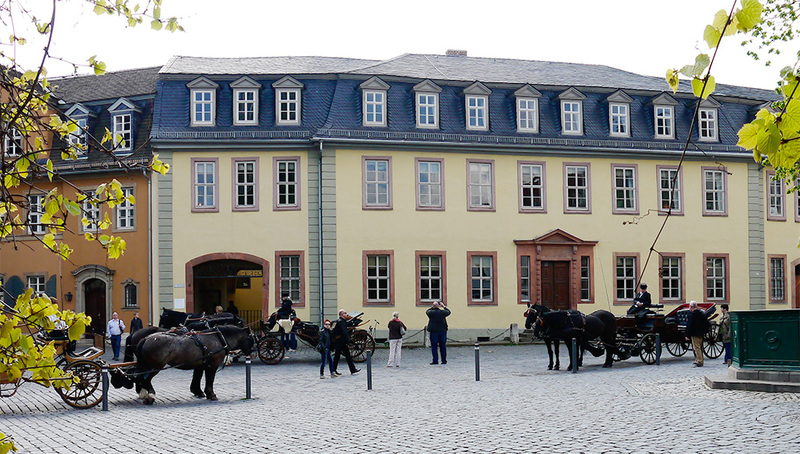 A Schiller museum was established at the back of Schiller’s home between 1984 and 1988. The contemporary new building which now gives access to Schiller’s home fits in nicely with the historical building complex. A bronze torso on a sandstone block was set up in the front yard of Schiller’s home opposite to the entrance. It was created by Wieland Förster (born in 1930) as an “Hommage à Schiller”. The neighbouring house in classicist style in Schillerstraße 14 was the home of Henriette Ottilie Ulrike von Fogwisch (1776-1851) and her daughter Ottilie (1796-1872), who was Goethe’s daughter-in-law. 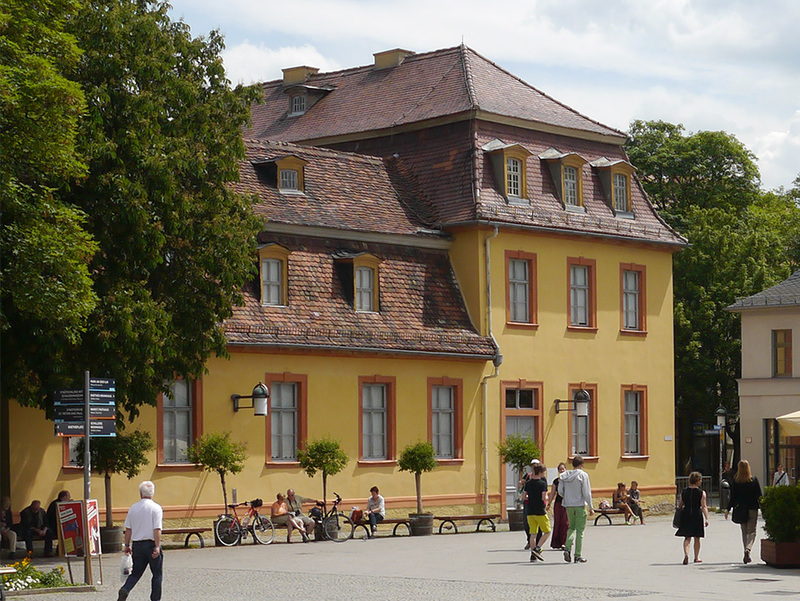 The town of Weimar developed beside the castle of the Counts of Weimar and Orlamünde around 1250. The church consecrated to Saint Peter was mentioned in 1253 for the first time. It was under the control of the German Knight Order from 1284 until taken over by the town in 1513. The St Peter and St Paul double patronage was mentioned in 1433 for the first time. The church’s oldest part is the west tower that survived the town fire of 1424 almost completely. The crown of the arch and the vesica piscis tracery of the windows originate from 1493. Between 1498 and 1500 the church was rebuilt as a late-Gothic aisled church. The west tower was not integrated into the building axis. The church corresponded to today’s basic layout with three naves, five bays, a polygonal choir and a Gothic vault. Strong buttresses supported the vault. A ridge turret was mounted. An inscription at the choir’s outer wall indicates the period of construction together with the insignia of the saints Peter and Paul, a key and a sword, the German order cross and the letter “W” for Weimar. 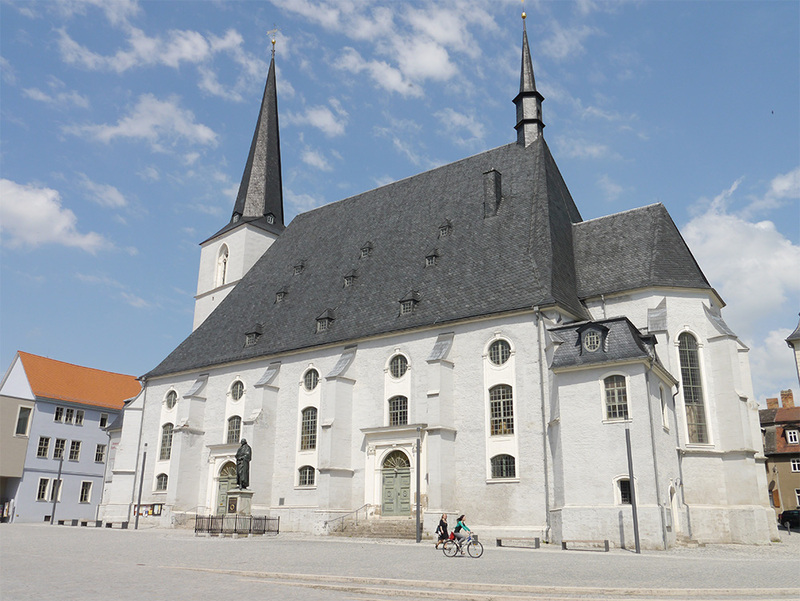 The church was redesigned in Baroque style between 1735 and 1745. Galleries were installed each of which required two round arches and a circular window for better lighting. The roof and vault were destroyed during an air raid on 9 February 1945. Thomas Mann supported the church’s reconstruction between 1948 and 1953 with a donation of 20,000 marks which he had received when awarded the Goethe National Prize. Luther already preached in the church in 1522. Johannes Grau (around 1480-1559) was the first protestant pastor since 1524. Johann Sebastian Bach’s children, among them Wilhelm Friedemann (1710-1784) and Carl Philipp Emanuel (1714-1788), were baptised in this church. Johann Gottfried Herder worked there for 27 years. A plain iron plate covers his grave in the nave. It bears his motto Light, Love, Life, a snake with the eye of God as a symbol of wisdom and eternity as well as the letters Alpha and Omega, meaning that the beginning and end lay in the hands of God. Until 1683, the church accommodated the family tomb of the Ernestine dukes with remarkable epitaphs and ledgers. The probably most important work of Lucas Cranach the Elder (1472-1553) and the Younger (1515-1586), the Cranach altar, is mounted in the choir. It is a winged altar whose design is based on Gothic forms including a shrine, wings, the backs of which are painted, and a crowing. The predella no longer exists. Lucas Cranach the Elder worked on the altar from 1552 until he died, his son completed the altar in 1555 as indicated by the date on the cross. Landscape painting that emerged during this time, Renaissance portrait paining, vivid colours and spatial depth are particularly striking features. What makes it different to a Gothic winged altar is that the former shows a devotional picture while Cranach’s altar shows the preaching of a sermon according to the concept of reformation. The cross in the shrine takes up the whole picture area. It is a symbol of Christ’s authority over heaven and earth. Christ has no tortured body and with his eyes half open, he has overcome death. The stream of blood from his side wound hits the head of the central figure of the group of persons on the right. This is a portrait of Lucas Cranach the Elder added by his son. The painter thus stands for mankind for whom Christ’s blood is shed. The left part shows the risen Christ triumphing over death, the devil and sin, which is represented by a snake. Death and the devil lay on their backs. As a sign of his defeat, the devil draws the transparent spear with the flag of victory, obviously a symbol for the action of the holy spirit, into his throat. The right part shows John the Baptist pointing with his index finger to the crucified Christ and with two fingers of the other hand to the lamb with the flag of the cross at the foot of the cross. Lucas Cranach the Elder is painted in the middle. The right figure represents Luther, erect, in a self-assured pose as the spiritual and organisational representative of reformation. The bible that he translated into German, the symbol of God’s word, is now accessible to everyone. Luther turns the bible towards the onlooker and points his finger at it. The following can be read among other texts: The blood of Jesus Christ cleanses us from all sin. (1st John 1.7). While the foreground refers to the New Testament, the background is reserved for the Old Testament. Adam is running into the fire of hell, the symbol for the fall of man and death, with his arms raised towards Christ and chased by death and the devil. Moses hands the tables of the laws, a symbol of the divine commandments and the old covenant, over to the high priest Aaron. The people of Israel are plagued by snakes, Moses lifts up a bronze snake on a pole, a symbol of the arrival of Christ and redemption. The annunciation angel brings the good news of the birth of Christ to the shepherds. The side wings no longer show any saints as mediators to God. Luther preached the idea of the merciful, personal God, the father-son relationship. Portraits of the princes and the altar’s founders served as an escape. Duke Johann Friedrich the Magnanimous and Sibylle von Jülich-Cleveberg are to be seen on the left and the sons Johann Friedrich II the Middle, Johann Wilhelm and Johann Friedrich III the Younger on the right. The left wing shows a brocade cloth with the letters VDMIJE, the motto of the princes: verbum domini manet in aeternum – the word of the Lord endures forever. The altar is a pictorial sermon on Luther’s doctrine of the redemption of sinful man solely through belief. The word of the Lord that endures forever is to be understood as a basis of ethical-moral values that are to be adopted from one’s predecessors and carried forward into the future. The middle part shows the basic concept of the Christian world, the law in action in the Old Testament and mercy at work in the New Testament. The castle of the counts of Weimar and Orlamünde was located on the lower mountain spur on the west bank of the Ilm river. The guardians of Emperor Otto III laid siege to the castle in 984 and Meissen Margrave Ekkehard I, who reigned from 985 to 1002, did so in 1002. The Thuringian Landgrave Ludwig III, who reigned from 1170 to 1190, besieged and destroyed the castle in 1173/74 and his brother Hermann I who reigned from 1190 to 1217 and was the father-in-law of the holy Elisabeth, laid siege to it in 1214. 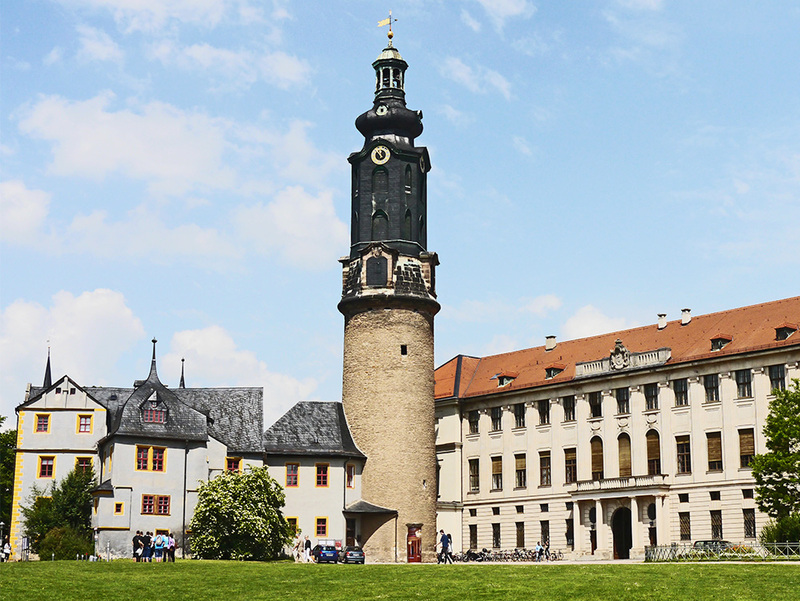 Around 1250, its town of Weimar is mentioned whose origins may have been situated in one of the outer wards. The castle was at least the town’s nucleus. Weimar fell to the margravate of Meissen in 1365. After the castle and town fire in 1424, the Gothic castle, called “Hornstein”, was built as the residence of the Thuringian landgravate which was an administrative branch of the margravate. The castle tower, partly from the 11th century, was renovated in 1439. A Gothic arch remains of a gatehouse, which was built at the same time, after changes had been made to the northern part in Renaissance style. The town’s oldest coat-of-arms is located below this and bears the Latin inscription: this Thuringian fortification and gate were completed in the year of the Lord 1439. The southern part of the gatehouse with its portal carrying a coat-of-arms is proof of the alteration work carried out to create a Renaissance castle between 1535 and 1545 under Prince-Elector Johann Friedrich I the Magnanimous, who reigned from 1532 to 1547 as prince elector and until 1554 as duke, and his master builders Krebs, who died in 1540, and Nicol Gromann (1500-1566). The crossed elector’s swords, the symbol of electoral dignity appear on the shield of the coat-of-arms. As a result of the Schmalcaldic War, the prince-elector had already lost his electoral dignity in 1547. The Duke’s permanent residence was now extended for court, household and administration purposes. Parts of the eastern wing burned down in 1618. The castle was reconstructed only slowly. Between 1651 and 1662, notably Wilhelmsburg castle was built under Duke Wilhelm IV, who reigned from 1626 to 1662. The master builder Johann Moritz Richter (1620-1667) erected a three-winged building modelled on French examples. In 1696, a theatre hall was finally built where the Koch and Seyler theatre companies, the latter with Conrad Ekhof (1720-1778), played. The castle or watchman’s tower was given a Baroque upper structure by the master builder Gottfried Heinrich Krohne between 1729 and 1732, which was changed again in 1750. Apart from the castle tower and the gatehouse, the residence castle burned down to the foundations on 6 May 1774 due to lightning followed by a smouldering fire. The chance of establishing a first stationary theatre in Germany was lost. The court had to switch to Belvedere Palace, Red Castle, Prince’s Palace and Wittums’ Palace. Goethe as the head of the castle building commission managed the construction of the new castle from 1789 to 1803. The master builders were Johann August Arens from Hamburg between 1789 and 1791, Nicolaus Friedrich Thouret from Stuttgart between 1793 and 1800 and Heinrich Gentz from Berlin between 1800 and 1803. Arens connected the two protruding main sections on the east side by an intermediate building whose rustic ground floor with round arches carries the gallery of Tuscan columns or colonnade. Thouret devoted himself particularly to decorating the rooms in Roman-Pompeian style. Gentz designed the electoral or great gallery with a coffered ceiling in the north wing. The staircase built by Gentz is among the most significant works of early German Classicism. Coudray continued with the construction of the castle from 1816 to 1835. He created a counterpart to the north-west pavilion and a two-floored intermediate building. Two sandstone lions, which were created by the court sculptor Weisser in 1806, keep watch at the west portal. After Goethe’s death, the design of memorial rooms for the four classical authors began. The Goethe gallery mainly designed by Schinkel as well as the Schiller, Wieland and Herder rooms were completed in the west wing by 1847. The Munich architect’s firm Jakob Heilmann und Max Littmann built a south wing from 1911 to 1913 under the supervision of Grand Duke Wilhelm Ernst, who reigned from 1901 to 1918. The monotonous stone construction with a colossal pilaster structure destroys the concept of a three-wing complex devised by Richter. A falcon at the triumphal archway bears the inscription: Vigilando ascendimus (by vigilance we rise up) – the motto of the Order of the White Falcon that had been founded by Duke Ernst August in 1732. After the abdication of Grand Duke Wilhelm Ernst in 1918, the palace became the temporary official residence of Reich President Friedrich Ebert. 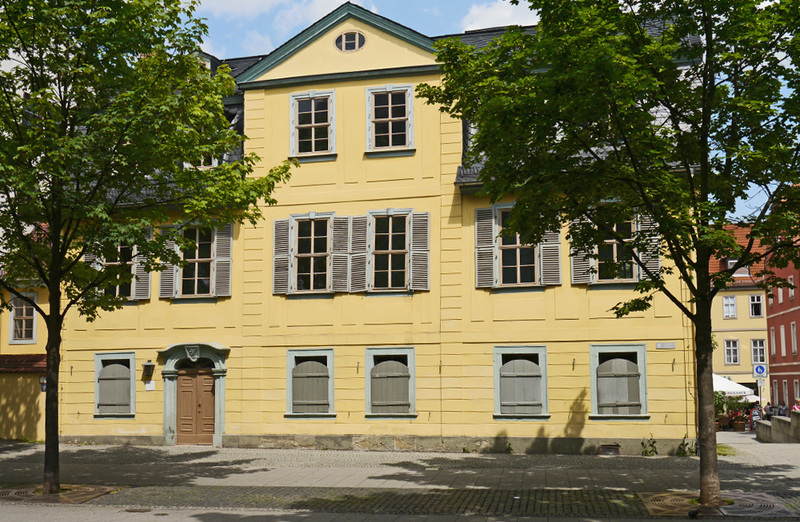 Today the south wing houses the headquarters of the Goethe Society and Weimar Classics Foundation. The other three wings are used as exhibition rooms for the art collections. They accommodate the Lucas Cranach gallery with works by Lucas Cranach the Elder and the Younger as well as Albrecht Dürer and Hans Baldung Grien, the Art and Crafts Collection from the prince’s chamber of art and curiosities, old Russian icons of the 15th to 19th century, medieval sacral works of art, Italian paintings of the 16th to 18th century, Dutch paintings especially of the 17th century, German paintings from the period between 1750 and 1850, paintings by French and German impressionists and works by painters from the Weimar school of painting. The city hall was established between 1526 and 1547. The late Gothic glare tracery is remarkable. The changing intersection of the tail sheets gives the coolness of the ending gothic to the gable. The relay gable carries a going out of the medieval stylistic idiom as conclusion round arches, filled out with strongly stylized motives for cloverleaf. The top of the gable was put on 1812 in the neo-Gothic style and bekrönt with the knight figure of a former roof tower. After the complete destruction during the bomb attack in February 1945 the city hall was again developed from 1968 to 1971 as the first building at the market. Occasionally the building than city hall served. In the ground floor stands of the butchers – so-called meat banks -, bakers, shoemakers and shopkeepers were furnished. In addition a Schankkeller came. In 18. Century one kept for sale here to cloth. Around 1800 yard balls and other entertainments took place in a large hall in the upper floor. Goethe organized masked balls in honours of the birthday of the duchess Luise. Johann Nepomuk bumblebee gave here 1822/23 education concerts. In the post-classical Weimar occasionally the new Weimar club, an artist club met with Franz Liszt and August Heinrich Hoffmann von Fallersleben in the advice room, who stood in opposition to the fussy Weimar. Today the house accommodates the tourist formation and in the basement with its Gothic ton vault the restaurant Ratskeller. After the fire of the Renaissance town hall in 1837, the west side of the market square was redesigned. The town hall that had protruded into the market square was brought in alignment with the other buildings and relocated from the north side to the corner of Windischenstraße. The house front was moved westwards by 20 meters, leading to a substantial extension of the market square. The new town hall was built in neo-Gothic style between 1838 and 1841. Baurat Heinrich Heß thereby replaced the Classicist style with the Historicist style. The echeloned tower has an open cap. The neo-Gothic lancet windows, the protruding balcony and the terracotta frieze give the building an austere and ceremonial character, intensified by the contrasting colours of the red terracotta and grey travertine stones. Today the town hall accommodates the offices of the Lord Mayor and the meeting rooms of the municipal administration. In 1987, a carillon made of Meissen porcelain was installed in the open tower. One of the bells bears the trademark of the porcelain manufactory, the crossed blue swords, which is visible for people looking from the market square. Prof. Börner, the director of the artistic department of the porcelain manufactory, resumed the tradition of Böttger and Kaendler to manufacture working carillons. The carillon can be operated electronically and manually. The bells are suspended such that they can swing freely and are struck with clappers from outside. The carillon strikes every quarter of an hour. Pieces of music, most of them relating to Weimar such as “Joy, fair spark of the gods” by Schiller and Beethoven, can be heard three times a day at the full hour. Minister Jakob Friedrich von Fritsch (1731-1814) commissioned Johann Gottfried Schlegel, the state architect, to build a palace that was erected between 1767 and 1769. The painter Adam Friedrich Oeser, who taught Goethe the art of drawing in Leipzig, acted as artistic adviser. In 1775, von Fritsch sold this palace to Duchess Anna Amalia who had already been residing there since the fire of the town castle in 1774. The building complex was named Wittumspalais after her (Wittib = old German word for widow, Wittum = possession, estate of the “Wittib”). The three-floored palace with its plain, simple structure and little use of decorations is an example of the late Baroque style. A central two-axis projection structured by pilaster strips carries a group of putti surrounded by vases that was designed by Oeser as a roof parapet. A two-floored wing is connected to this building at right angles on Theatre Square. As the surrounding land was raised in Schillerstraße and on Theatre Square, the ground floors of the buildings are hidden or only their upper part is visible. The real height of the buildings, however, can be seen from the courtyard behind. The palace was built on the grounds of the former Franciscan monastery with buildings erected around the end of the 16th and the beginning of the 17th century including a former dyeing works on the now canalised Lotte stream. The gatehouse with niche seats and the high-gable corner building were integrated into the palace complex. Towards Wieland Street an English and a French garden were located on both sides of the town wall and remnants thereof are still to be found in the courtyard. The official entrance to the palace passes, as it is still today, through the wrought-iron gate with Baroque sandstone posts and the gatehouse and across the courtyard with its original cobblestones. Anna Amalia had her town residence in the Wittum’s palace until she died on 10 April 1807. Members of the court society and artistically gifted bourgeoisie met at her residence in a social circle, the so-called round table. Thanks to its artistic productivity, this circle, to which Goethe, Herder and Wieland also belonged, was widely known beyond the bounds of Weimar and a centre of attraction for the like-minded from similar social circles from other parts of Germany. The round table met in the reading and dining room, the so-called round-table room, a corner room with three windows looking out on Schillerstraße and two out on Theatre Square. Between 1791 and 1797, Goethe’s “learned society”, the Friday society, also met at the Wittum’s palace for diverse scientific lectures. Since 1871, the furniture and art objects of the duke’s mother Anna Amalia have been preserved and kept as a rare example of court culture at around 1800. At the same time, the museum makes the visitors aware of a memorable woman from a great period of German history.